Blog Xylitol – What Is It and Why Is It so Dangerous for Our Pets? Xylitol – What Is It and Why Is It so Dangerous for Our Pets? Most pet owners know that chocolate is a no-no for dogs, that warning seems to go over well but recently despite being deadlier, I’m finding that not enough people know about Xylitol. Before I did research on the chemical, I assumed it was a human created conundrum. While it is manufactured as a sugar substitute from corn, trees, and some fruits, it does occur naturally. Corn, many fruits like berries and some trees have it naturally occurring, but not in the concentrated amount we’d find in sugarfree gum, peanut butter or the worst, chocolate. Xylitol is essentially sugar alcohol, so while it provides the sweetness of our splendid friend, it also has a low glycemic index and the ability to fight dental plaque, so it seems to be much better than sugar – quite the opposite in fact. No, you won’t get drunk on it, in fact, you’ll find it as sweet as sugar but with 60% less of the calories. It also has plaque fighting capabilities and simulates saliva. You can imagine why this sweet substance has become so popular in a sugar-addicted society. Not only will you find it in candies, gum, baked goods and peanut butter, but this sweet delight has been added to many over the counter drugs, particularly children’s gummy vitamins, allergy meds, cough syrups and nasal sprays. So when you have your dog on Benedryl or give that pill in peanut butter, you better check if either contains xylitol and here is why. Unlike in humans, xylitol is quickly absorbed into the bloodstream of dogs and results in a potent release of insulin from the pancreas trying to play catch up from the massive sugar dump it just got. Normally, sugar stimulates the pancreas to produce insulin but xylitol causes such a rapid release of insulin that a HUGE decrease in the level of blood sugar (hypoglycemia) happens. This can occur within 10-60 minutes of eating the xylitol. Left untreated or unnoticed, this hypoglycemia can be life-threatening. The xylitol-induced hypoglycemia can lead to seizures, liver failure and eventually death if not treated. It’s serious, more so than if they ingest chocolate. What Are the Signs of Xylitol Poisoning? This can all happen very quickly after a dog is suspected of eating it, usually within 15-30 minutes of consumption. What Should I Do If I Suspect My Dog Ate Xylitol? The best thing to do BEFORE this occurs is take our pet first aid course, prepare yourself for ways to avoid allowing or leaving xylitol in your house. 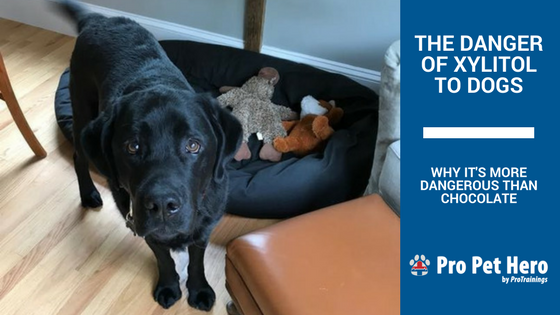 Learn to recognize the signs and symptoms, the information to gather and be the best advocate for the veterinary care your pet will need. If you believe your dog has eaten some xylitol or substance containing it, first and foremost call your veterinarian or the ER veterinarian if after hours to notify them that you will be coming in for xylitol poisoning. You may also contact the Pet Poison Helpline (800-213-6680) to get further instructions if you are a good distance from a vet, remember, to have a credit card handy. Provide information such as how many pieces/how much was suspected to have been ingested, how long ago, the name, type, and brand of what they may have eaten etc. Be your pet’s detective! Do not panic, this will elevate your dog’s heart rate too and potentially speed up the rate of the xylitol affecting their system. READ LABELS! Xylitol is becoming so common based on the sweet properties that make it so seemingly better than sugar. Read every darn label before you give anything to your dog, or bring anything into your home. Check what other people bring into your home. Twice now I have had wonderfully responsible dog owning friends have dogs go down from xylitol poisoning because their child’s friend had some sugar-free gum in their bag. The dog found it, ate it and boom, instant issue. Store bags up high in a closet, go through them or leave them in the car without the dog. We have to be a little like Sherlock Holmes when it comes to the safety for our pets and sadly it’s with products that are becoming super popular. Products that are actually beneficial to us like xylitol and grapes, but can be deadly to our pets. Pay attention to what you are bringing in and especially anyone you welcome into your home. 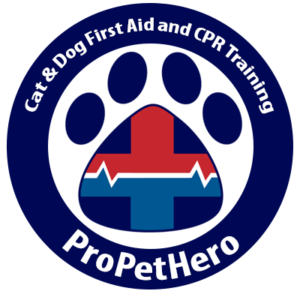 Educate your friends and family members about dangers such as xylitol, and if you have a pet, you know you should take a pet first aid course.